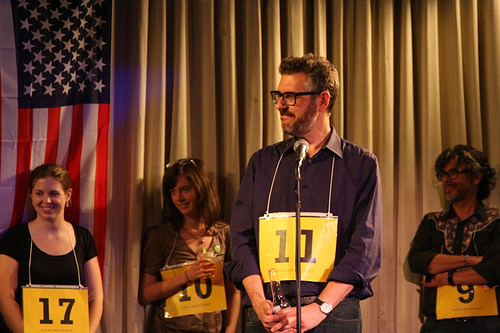 It's a spelling bee -- for adults. 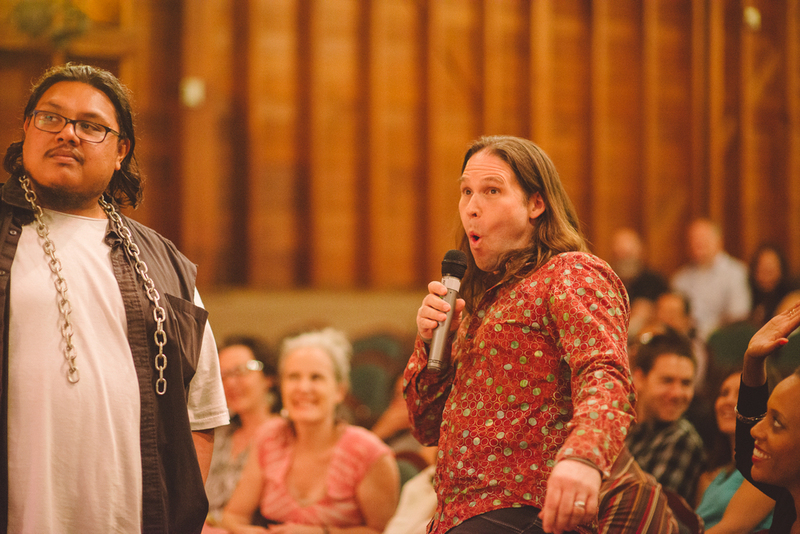 It's a comedy show that gives your community a chance to enjoy a genuinely fun night out. It's The Spelling Bee Company! 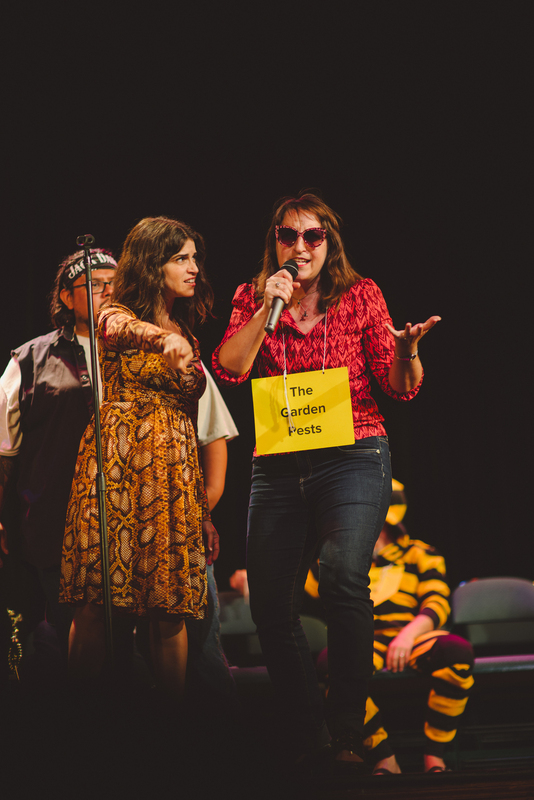 From the original creators of the Tony Award-winning The 25th Annual Putnam County Spelling Bee, our signature adults-only spelling bee show offers a belly-clutching evening of hilarity that raises money for your organization and brings your community together. and we will be in touch shortly to spell it all out for you! The creators of The 25th Annual Putnam County Spelling Bee bring the thrill of a live adult Spelling Bee to your community's next fundraiser! Our company members are all professional performers and comedians with years of improvisation experience. These veteran improvisers and comedians will put your spelling acumen to the test while providing you with non-stop laughter, suspense and obscure vocabulary! It all started when we were asked to host a Bee for 826LA, the organization founded by author Dave Eggers. We hosted fundraisers for his New York and San Francisco branches as well, and helped them raise over $200,000. Since then, we've been hosting live adult spelling bee fundraisers for schools and nonprofit organizations in Los Angeles, Denver, New York City, Seattle, the Bay Area, and more. The Spelling Bee Company is a wonderful group to work with! They were all very supportive and helpful. We were able to raise 75% more funds than last year. This event allowed us to connect on a deeper level with our community and introduced us to so many new donors. The exposure propelled our organization to gain recognition throughout the arts education and Broadway community. Not to mention, it was an incredibly fun and rewarding experience!! We can't wait for next year! The spelling bee company is amazing. Our school raised $60k from this show. The show itself is hilarious and a lot of fun. This was an awesome experience as a fundraiser! I highly recommend. The Spelling Bee Company was helpful, offered a lot of suggestions and support to make our event a huge success. We are a Title 1 school, thus over 50% of our students are below poverty ... and we were still successful. It's also a fantastic community building event for your school! I highly recommend. Last year, I had the opportunity to work with TSBC on a school fundraiser. At my nonprofit, the last fundraiser we had was losing steam and we could barely raise the funds we needed. The time had come where we had to let go of our traditional event and do something to inspire people and bring our community back together. The outcome for hosting a spelling bee was better than we could have ever expected and our community had an amazing time fundraising and enjoying the event. We went from a fundraiser that could barely raise 5k to one that raised 36k. Needless today we're doing it again this year and everyone at our organization is looking forward to it! Spellers at the Ben Franklin Magnet Elementary spelling bee fundraiser. Thanks for filling out this little form. We'll be in touch within 24 hours! How Did You Hear About Us? * I saw your show! I heard about it from someone I know! You sent me a newsletter! You sent me an email! I found it on social media! I found it through an online search!